Welcome to the last day of July. Oh, where has this month gone? And of course, happy Monday! I’d like to give a shout out to Colleen who won the novellas from my post last month. I hope you like reading about my ‘Single Dads Next Door.’ They were so fun to write about. Now for July reading confession. I’m reading a new book club pick, Flight Patterns by Karen White. What an amazing author. I always keep a Karen book on my desk. When I get stuck, I read a passage or two of hers for sheer inspiration. On a drier note, I guess, my non-fiction book was Better Health in 120 days by Dr. Glen Aukerman. My dad, who is fighting cancer, had this book on the table next to his chair. I started reading it while I was visiting him and ended up taking it home. Not sure I’m glad I read it or not. It’s worth a reread if you want to take it all in, but reading about food and what is what ends up being confusing and sad for me. Not much is good for us. BUT, I will not focus this post on that. I’ve surprised myself at my non-fiction reading. I’ve started another non-fiction book, Goliath Must Fall by Louie Giglio. One of my fav authors just had a new book release. Pattie Callahan Henry, The Bookshop at Water’s End. Pattie is an amazing lady, and an amazing author. I love her style of writing. Love, love it. There are certain times, and having one of my favorite authors release a book is one of them, when I start reflecting on my own writing, my own stories. I, in some ways, always feel like I’ve fallen short. Like I’ve missed the mark. And this is not about another author writing “better” than me. We all have our own voice. It’s more about how much I feel I’m “putting into the book” if that makes sense. I feel that if I write a book, and I’m unchanged, then have I really put everything into the story that I could have? I have no idea why I feel like I need to be wiped out after finishing a novel. I’ve certainly never heard that taught in a workshop. But, it’s probably more of a conscious thing for me. Hopefully not a guilty one. But the questions remain: How much of me am I putting into each book I write? Can I pour more of my soul into the story? Do I have skeletons lurking inside of me that I don’t want to put on the page? 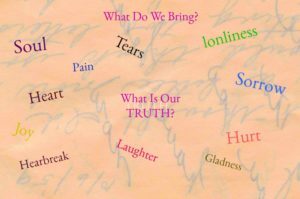 Do each of us have a break-out type of story embedded in us waiting to be revealed? These questions just aren’t for authors. They are for everyone in every aspect of what we do in life. How real are we? How invested are we in what we do, what we share? Can sharing a part of ourselves bring light into someone’s life? The book I’ve read that I was most emotional about was Redeeming Love, by Francine Rivers. I cried for days after reading that book. Not a bad cry, but a good cry. I still cry talking about the book. Now, I will admit, part of the emotion was from a writerly stand point. I knew at what point I was going to lose it. I don’t want to give anything away, but the realizations in the book are life changing. 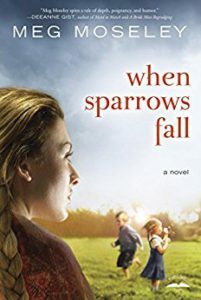 Also, Meg Moseley’s book, When Sparrows Fall had the same type of feel at the end, a washing of the soul if you know what I mean. Thanks Lindi for sharing your reading adventures. My reading goes in spurts on whether I read for entertainment or to read something deeper. Since life is filled with enough troubles (politics, health, family concerns) and teaching literature for 20 years, in retirement I prefer to read more entertaining works, if they are well edited and written. My favorite fun series this summer is the Beach Brides. Twelve heartwarming, sweet novellas linked by a unifying theme – a message in a bottle. Twelve friends from an online book group meet in person for a Caribbean vacation. On a silly dare each lady writes a message, stuffs it in a bottle and casts it out to sea. Bride 11’s story will be released tomorrow. Unique out of the bottle fun entertaining beach read. My emotional read this year is Ruth Sepetys’ Salt to the Sea. WW2 is drawing to a close in East Prussia and thousands of refugees are on a desperate trek toward freedom. My mother made the same trek in January 1945, which my mom recorded in her diary. I found my mom’s diary after my father passed in 2014. Fortunately, my mom did not board the Wilhelm Gustloff, one of the worst marine disasters in history. Over nine thousand souls perished. This story hit close to my heart. Made me admire my mother’s courage, strength and resolve. Wished I had listened to her stories. Thanks for this very interesting question. Looking forward to reading the responses. Best wishes. Rentate—-Beach Brides sounds like fun reading. I have a couple of friends who have books in that series. I need to check it out for sure. And thank you for sharing your mom’s story–and yes, that would hit close to home. I love books that make you feel…sometimes, even if it isn’t the best feeling. And I can’t image finding a diary my mom had written. That would be amazing. I have my Grandmother’s yearbook. 1920 something–she was valedictorian. So cool! I love looking at everyone’s names…and all the grades had different fight songs. Redeeming Love was an emotionally challenging book to read. I couldn`t keep enouhg tissues handy. I usually read one book after another. Not so with this book. I loved it and pondered itfor several days before picking up another book. That said, one day I will read it again. Yes I have read emotionally spent books and yes I really need a light and easy book afterwards. Its almost like I need to recharge me batteries again. there have been many books I have been disappointed in. I give that author two or three tries and if I still feel this way I move on to different authors. For years I only stuck with authors that I liked. A couple of years ago, a friend challenged me to expand. And that is what I have been trying to do. Still sticking with the same genre, But adding in different authors and some modern books. Hi Lori. I think it’s great you give authors more than one shot. That’s awesome. I love that you are expanding what yippy ate reading. I love finding new authors. Okay. So that should say you are….auto correct!!! I very rarely read light hearted books. I started this summer because I felt after the political year we had had I needed a break! Those 3 light books I read were lovely for my heart. I also read Redeeming Love many years ago and a time or two again. Very emotion! I’ve also had my moments with Bodie and Brock Theone’s series set in the WW2 era. One thing I have kind of lost my taste for is the plethora of Christian self-help books. I reviewed so many they all started to sound the same. I’m back to just mostly reading my Bible every morning with a Classic or two as a devotional. It does cross my mind that Margaret Feinberg’s Scouting The Divine was so delicious I’ve read it 3 times. Hello. Thanks for that book recommendation. I love hearing of books people have read more than once. And I’m glad you found some light hearted books you enjoy. I recently read Sharon Hinck’s “Stepping into Sunlight.” It was not an easy read, but it’s very well-written. I did need to read something lighter after that! However the one I chose next started out good, but the ending was disappointing :-( Oh well! Thanks for sharing. Lindi, thanks for sharing what you’re reading. It’s been a while since I’ve read When Sparrows Fall. I did love that book. The characters were wonderful. I want to care about characters in a book. The plot isn’t that important to me. I want to feel the characters, be inside their skin. That’s the way I felt about When Sparrows Fall. I just finished a book by Sharlene MacLaren, Summer on Sunset Ridge. It’s about Quakers and the Underground Railroad. I loved the hero and heroine. Merrilee…ah, yes, I so enjoy connecting with great characters. You can follow great characters anywhere, right? Thanks for sharing what you’ve been reading. I’ve read emotionally deep stories … but (1) I can only read one of those every few months because I usually get really involved in the plot and they leave me emotionally spent (and I wont read another book for days after finishing something like this) and (2) I often look for a light-hearted story to end the day on a better note because life often leaves me emotionally spent on its own, so give me light fiction to balance things out. As for disappointments after reading, there are many different kinds.. recently I just couldn’t cope with reading a book that seemed to have a great premise but the characters hated each other until they decided to get married… (against their wills?! who knows!!! just makes no sense), then I’ve read emotionally deep books that end without a feel good finale that just makes me want to keep crying for the characters (really?! why would anyone want that? I get it some people like real life stories, but then don’t say it’s romance, I expect happy endings), and the worse kind for me is those shallow stories that construct fake and forced relationships, without any depth to it (there seems to either be a bunch of those out there or I’m just lucky to be drawn to those). Hi Priscila.i will admit to putting books down if they dont hace a happy ending. I only watched half of Titanic the other night because I couldn’t bear a sad sending. I think I go through phases like that. that’s awesome you read such a variety!! I love reading different genres, too. I received your email replied back. I will resend it. Wow! I’m glad I had time to come back and read this! It really explains why some novels really touch the reader, and others are only read for enjoyment. The most recent one I’ve read that made me stop and think, is Skye by Heather Gray.